The Terrain plugin for 3DS Max allows you to generate landscapes from real world elevation data in a couple of clicks. The plugin makes use of DEM data that is available freely on-line but instead of you having to locate the right DEM file for your needs, patching them together and importing the data manually our plugin allows you to directly set a latitude and longitude coordinate and the plugin will automatically locate the right data and import it into 3DS Max and generate a mesh to your desired level of detail. You are free to drag the location around and zoom in or out and the plugin will fetch any new data it needs and rebuild the mesh automatically. The data will be stored on your system so future alterations will not require data to be re downloaded. The elevation data is sampled at 90m intervals and also for the US you can select 30m interval data for even more accurate terrains. 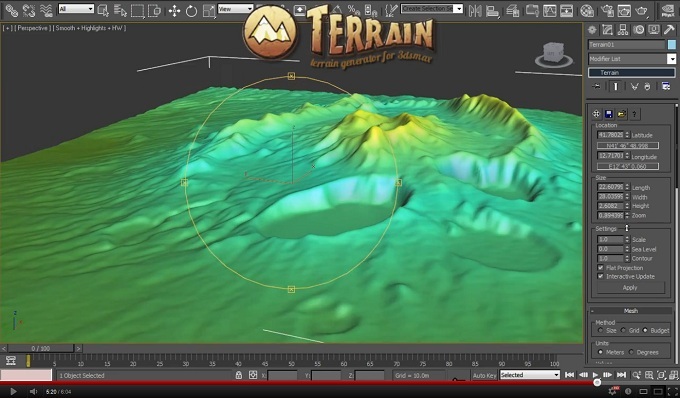 The Terrain plugin is available for Max 2008, 2009, 2010, 2011 and 2012 bot 32 and 64 bit version. Support for Max 2013 is coming soon. More information here.